Simon McCartney was a cocky young British alpinist climbing many of the hardest routes in the Alps during the late seventies, but it was a chance meeting in Chamonix in 1977 with Californian ?Stonemaster? Jack Roberts that would dramatically change both their lives - and almost end Simon?s. Inspired by a Bradford Washburn photograph published in Mountain magazine, their first objective was the 5,500-foot north face of Mount Huntington, one of the most dangerous walls in the Alaska Range. The result was a route so hard and serious that for decades nobody believed they had climbed it - it is still unrepeated to this day. Then, raising the bar even higher, they made the first ascent of the south-west face of Denali, a climb that would prove almost fatal for Simon, and one which would break the bond between him and climbing, separating the two young climbers for over three decades. But the bond between Simon and Jack couldn?t remain dormant forever. A lifetime later, a chance reconnection with Jack gave Simon the chance to bury the ghosts of what happened high on Denali, when he had faced almost certain death. 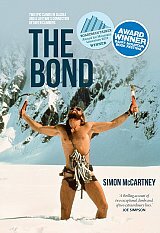 The Bond is Simon McCartney?s award-winning story of these legendary climbs.